Louisa Watkins is the fourth post-Civil War posthumous portrait I have seen that depicts a person George Caleb Bingham may never have met or barely knew. To create the portrait, he had to rely on a photograph. The others are Sarah Ann (Sallie) Elliott (Mrs. Henry A. Neill), Julia George, and Julia’s brother, Richard Booker George. All four subjects sit facing forward, in the immovable and resolute manner that people sat before a camera in the early days of photography. With its widened temples, Louisa Watkins has the tell-tale “Bingham look.” Some of the Missouri Artist’s students could mimic that “look,” which causes mis-attributions even in the present day. But, everything about Louisa Watkins from hair to lace, to fingertips, speak of George Caleb Bingham. Provenance proved my theory that the Missouri Artist painted the portrait from a photograph after the sitter’s death. Louisa Ann Conwell was born on August 20, 1839, in Xenia, Greene, Ohio, to Richard Conwell and his second wife, Eliza Beatty. (The note writer was a few months off in the written recollection, but close enough.) Louisa was the eleventh of her father’s twelve children. Her father died when she was five. As her widowed mother raised her six children and a mentally challenged step-daughter, she had the help of at least three of her older stepsons, who lived nearby with their families. In the late 1850s, Louisa, along with several of her older siblings and half siblings, moved to Kansas City, Missouri. When she was 19, she met a 29-year-old businessman, John Q. Watkins. On June 9, 1859, she married him. Their first child, Judith Chevallie Watkins, was born on July 2, 1861. A year later, on June 9, 1863, Louisa gave birth to a son, John Q. Watkins, Jr.
John Q. Watkins purchased Kansas City’s oldest bank in 1864. Originally founded in 1856 as Coates & Hood, with a subsidiary real estate firm, Northrup & Co., the bank was later renamed Northrup & Chick. As Watkins Bank, the facility moved to a new building at the corner of Main Street and 2nd Avenue. Louisa and John’s third child, Robertine Lela, was born May 10, 1865. That same year, the men of Kansas City elected Watkins to the City Council. Louisa gave birth to their fourth child, her namesake, on May 11, 1867. The birth must not have been an easy one because a little over a month later, on June 20, 1867, Louisa died. Her resting place is in Kansas City’s historic Union Cemetery. After her death, Louisa’s oldest child, Judith Chevallie, or Vally as she was called, 5, was sent to live in a convent school. Watkins’ banking partner, George Bryant, and his wife, Bettie, adopted the baby, “Lulu,” and raised the younger daughter, Lela. The early life of her son is not currently known, but by the age of 17, he lived with his father in rooms in or near the bank. Watkins never remarried. He invested in Kansas City’s first streetcar company and in the county’s first Horse Railroad Company in 1870. By 1874, he owned a silver mill in Colorado. The bankers of Kansas City elected him president of the town’s Clearinghouse.9] When Watkins retired, he returned to his family’s Virginia plantation. There he died in 1899 at the age of 70. Johnston Lykins (1800-1876), George Caleb Bingham’s good friend, presided over the Kansas City branch of the Mechanic’s Bank. Lykins and John Q. Watkins would have interacted professionally. They probably attended some of the same social functions and charity events. Bingham was part of the same circle. He may have met Louisa Watkins before her death. In addition to stylistic and historic evidence, the feature of the Watkins portrait that most defines it as a Bingham is its psychological engagement. Bingham imbued Louisa Watkins with an almost innocent, yet enigmatic, expression. That the model for the portrait was a tiny, ten-year-old daguerreotype makes the feat all the more amazing. Family information derived from public records on Ancestry.com, including birth and death records, and census data on family members for the years 1840-1880. Carrie Westlake Whitney, Kansas City. Missouri: Its History and Its People, 1808-1908, Volume 1 (Chicago: S. J. Clarke Publishing Company, 1908), 145. Later in the history, Whitney used 1865 as the date of transfer. Early view of Main Street and 2nd with the Watkins Bank in view on the corner. Delaware Street bluff in view behind the bank, Photograph dated July 1868, Scrapbook Collection #3 – Historic Kansas City, P24, Box 1, Page 7, Number 29, Missouri Valley Special Collections, Kansas City Public Library, http://www.kchistory.org/cdm4/item_viewer.php?CISOROOT=/19th&CISOPTR=369&CISOBOX=1&REC=10 , accessed November 2016. United States Census Bureau, Census of the United States, “St. Teresa’s Academy Catholic Convent,” June 8, 1870; Third Ward, Sub 43, Kansas City, Jackson County, Missouri; National Archives and Records Administration, Series M593, Roll 782 , page 33, lines 35. .
 Un-sourced Statement in Ancestry.com, but confirmed with 1880 census, “Household of George Bryant,” Kansas City, Jackson County, Missouri, page D, lines 17-20; Watkins and Bryant partnership confirmed in Wm. Crosby and H. P. Nicholes, “Private Bankers, Missouri,” The Bankers’ Magazine, and Statistical Register, Volume 20 (Banks & Banking, 1866), 93. Whitney, op. cit., 675; Rocky Mountain News Print Company, The Colorado Directory of Mines: Containing a Description of the Mines and Mills, and the Mining and Milling Corporations of Colorado, Arranged Alphabetically by Counties, and A History of Colorado from Its Early Settlement to the Present Time (Rocky Mountain News Print Company, 1879), 193; I. S. Homans, The Banker’s Almanac and Register, 1877 (Banker’s Magazine, 1877), 83. In May 1870, Bingham moved from Independence, Missouri, the town adjacent to Kansas City to the east, into a new studio above Shannon’s Dry Goods Store in Kansas City, at 3rd and Main, one block from Watkins Bank. Bingham’s proximity to Watkins made him the logical choice His national and regional reputation made him the artist of choice for Kansas City businessmen and socialites. 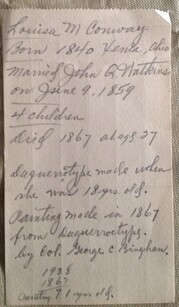 This entry was posted in 19th Century American Portrait Artists, Art Detectives, George Caleb Bingham, Professional Art Research and tagged 19th Century Portraits from Photographs, George Caleb Bingham, Louisa Ann Conwell, Mrs. John Q. Watkins, New George Caleb Bingham Portrait, Posthumous Portraits. Bookmark the permalink.